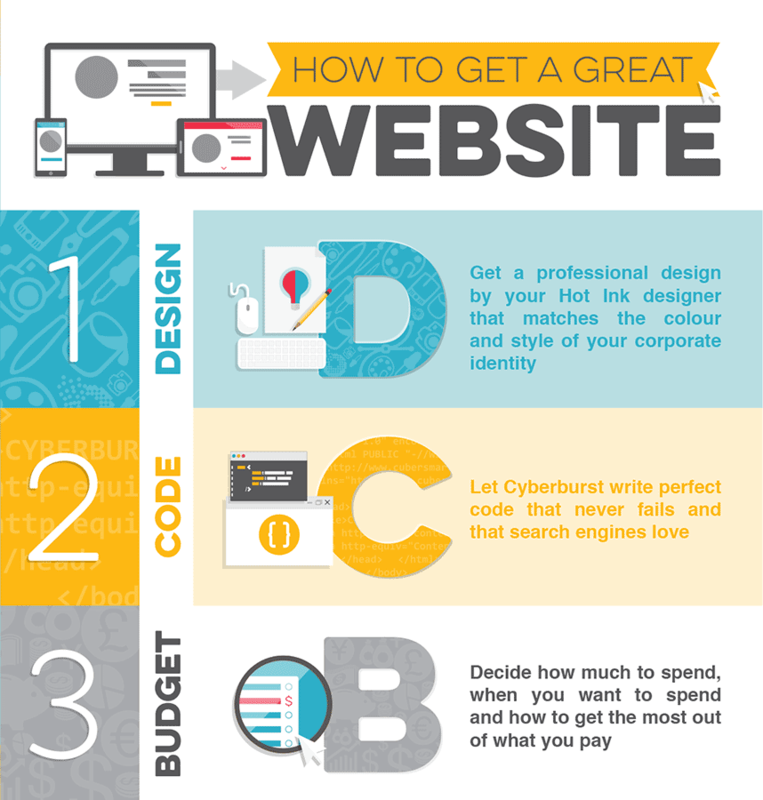 Hot Ink recently teamed up with coding experts, Cyberburst, to add Website Design to our service offering. Our clients can now maintain aesthetic integrity across all media, continuing to work with their own Hot Ink designer, to build FAST LOADING, SEO FRIENDLY websites that are RESPONSIVE on all devices. 1. Our websites are EXTREMELY FAST and offer instant page loads due to technology that is unique to Cyberburst. You can’t afford to lose a potential customer because they got tired of waiting for your webpage to load. 2. They have EXCELLENT SEO (Search Engine Optimisation) so they are easily found by Google. 3. They are FULLY RESPONSIVE which means they display perfectly on all devices: computers, laptops, cellphones or tablets. 4. By working with Hot Ink we can ensure BRAND CONSISTENCY across all your media, both print and digital – we become your ONE-STOP-SHOP! 5. You have the option of MANAGING YOUR OWN CONTENT (if you want to) and training will be provided. 6. YOU DETERMINE THE BUDGET: we provide a list of options, you simply choose which elements you require – NO HIDDEN COSTS (view rates). So if you need a new site or haven’t updated your own in a while, chat to us about creating one for you that’s beautiful, relevant, fast and responsive!